William Lambert White was born in 1767, the son of William White of Trowbridge, Wiltshire (1726-1810) and Nelly née Mervyn (1737-1816), daughter and co-heir of John Mervin. In 1781 he was indentured as an articled clerk to Ivan Vaughan of Frome Selwood, Somerset. On 25 June 1789, at the age of 22, he married Anne Messiter (1761-1852) at Yeovil. She was the daughter of banker Moulten Messiter Esq of Wincanton and Mary née Ring. They were to have one daughter, Letitia, born in 1790. William was an attorney and lived at Pitney House in Kingston (see map and photograph below) with Anne and their daughter Letitia. The Universal British Directory of 1791 listed William Lambert White as one of the four Yeovil solicitors, the others being Edmund Batten, George Proctor Upton and Samuel Watts the elder. The London Gazette reported that on 6 December 1791 "The Lord Chancellor has appointed William Lambert White, of Yeovil, in the county of Somerset, Gentleman, to be a Master Extraordinary in the High Court of Chancery". In March 1793 the Bath Chronicle reported "Samuel Bailward Esq, of Horsington, high-sheriff for this county, has appointed Mr WL White, of Yeovil, his county clerk. In 1819, in his role as a solicitor, he gave evidence in a Parliamentary enquiry into the dwellings against the churchyard wall in Silver Street. He was listed as an attorney and also an agent for Westminster Life Fire Insurance at Kingston in Pigot's Directories of 1822, 1824 and 1830. In 1794 William is known to have been a shareholder with a £100 shareholding in the Somersetshire Coal Canal. This was a venture promoted by the mine owners of the North Somerset coalfields as a cheaper means of transporting coal to their markets in Bath and Wiltshire since in Somerset, before canals were built, the only transport was by pack-horse or horse and cart, which could only cope with limited quantities and resulted in high prices. This shareholding would be the equivalent to over £120,000 at today's value. William was a prominent member of the Yeovil Freemason's Lodge from the 1820s onwards, being initiated into the Lodge of Brotherly Love on 12 December 1826..
William became a partner of banker Henry Whitmash. The company was known as Whitmash & White. 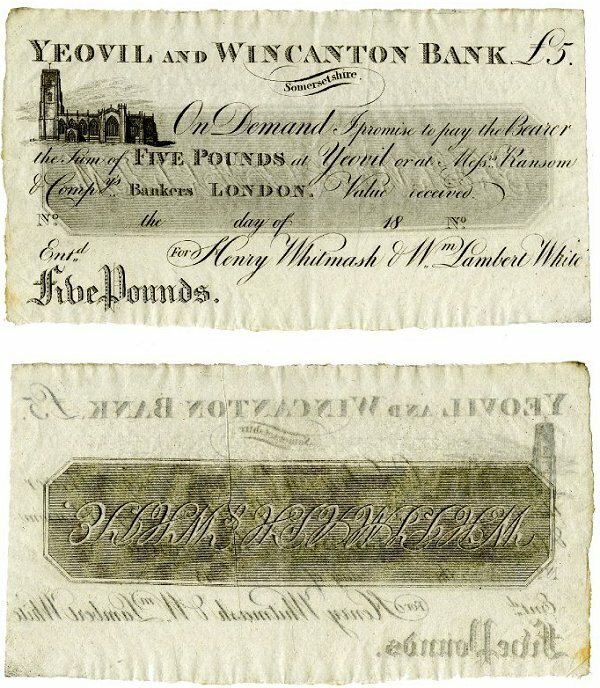 When Whitmash opened up branch of his bank in Yeovil in 1808, it became known as the Yeovil & Wincanton Bank. The bank printed its own banknotes in £1, £5, and £20 denominations, but only the £1 and £5 notes are known to have been issued. In 1835 the bank was acquired by Stuckey's Banking Co, but the trading name was retained until 1837. William White served as a trustee of the Woborn Almshouse, he was a member of the Vestry and became a Town Commissioner in 1830, acting as treasurer until his death. According to the memorial tablet, shown below, in St John's church he was for "many years Lieutenant Colonel of the East Somerset Yeomanry Cavalry" - actually only from 1825 until it was disbanded in 1828. He is known to have been a Freemason in Yeovil from this time. 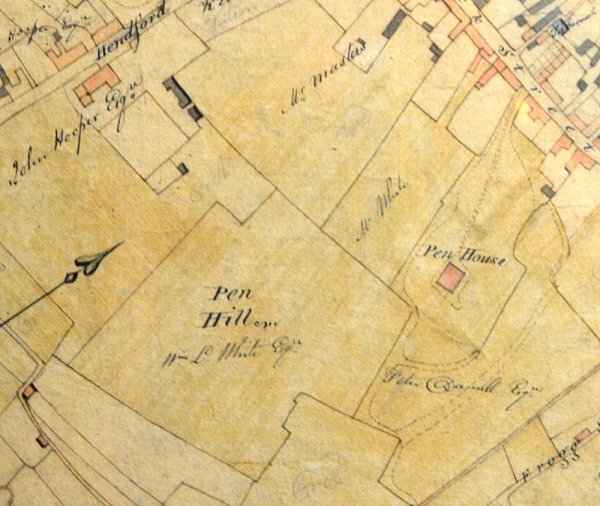 E Watts' map of 1806, shown below, reveals that William owned almost the whole of Penn Hill from South Street nearly all the way to Brunswick Street. 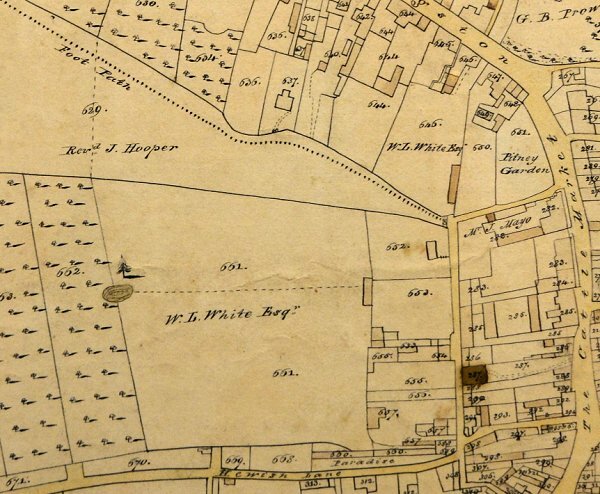 Watts' later 1831 map, also shown below, reveals that he owned the land which would later be home to Yeovil Town's football ground and is now occupied by Tesco's store and much of its car park. In 1831 there were riots in England when Parliament decided against reform to give Britain's industrial cities and towns better representation. Many of the solicitors in Yeovil were active anti-Reformers and had been professional election agents of Lord Ashley. Consequently they were the first to be singled out by an angry mob on the night of Friday, 21 October 1831, in what was to become known as the Yeovil Reform Riot of 1831, who attacked Pitney House, the home of William Lambert White, and also the homes of Edwin Newman, Francis Theophilus Robins, Edwin Tomkins and John Slade. As a solicitor, he was in partnership with John Slade but, as indicated by a notice placed in the London Gazette, William terminated his solicitor's partnership with Slade in 1833 although he remained with his banking concerns. In 1834 he was listed as a subscriber to William Hull’s “History of the Glove Trade”. In the 1841 census 74-year-old William and 80-year-old Anne were living at Kingston with four servants. Williams occupation was simply described as of independent means. The census also revealed that he was not born in Somerset. In the 1832 and 1834 Yeovil poll books William was listed by virtue of owning his freehold house in Kingston. Perhaps surprisingly in the 1840 and 1841 poll books for Weymouth, Dorset, William was listed as entitled to vote there as well by virtue of owning a freehold house at Chapelhay Steps, Weymouth, even though he lived in Yeovil. William Lambert White died on 17 April 1845 in Yeovil. He was aged 77. In the 1851 Census Anne, by now aged 89, was living in Kingston with 61-year-old Leticia and her 77-year-old brother-in-law, William's brother, James White, of Bruton. Anne died on 20 March 1852 in Yeovil. William Lambert White's signature against the Vestry minutes of 29 December 1831. E Watts' map of Yeovil of 1806 showing the land holdings of William Lambert White running from South Street at top right, nearly all the way to Addlewell Lane at bottom left and including the bulk of Pen Hill. E Watts' later map of Yeovil of 1831 shows Pitney House, Kingston, at top right with his name in the large garden. Also The Field at lower left of centre accessed off Hewish Lane (today's Huish), annotated with his name would later become Yeovil's football ground with its famous sloping pitch. The field had, in 1806, belonged to the Goodford family. The site is now occupied by Tesco's store and much of its car park. 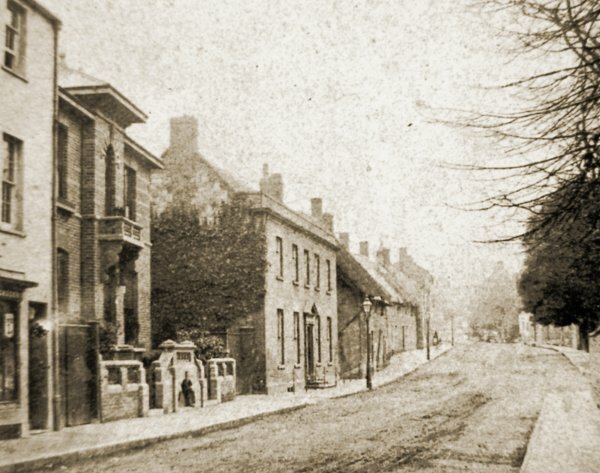 This photograph dates to about 1875 and looks north along Kingston as seen from just outside what would become Bide's Gardens. The impressive five-bay frontage of William's home and law practice, Pitney House, is seen at centre. The obverse and reverse of a five pound note of the Yeovil & Wincanton Bank featuring a drawing of St John's church. From the period 1808 to 1835, at which time £5 would be worth in excess of £300 at today's value. Notes were printed in £1, £5, and £20 denominations, but only the £1 and £5 notes are known to have been issued. 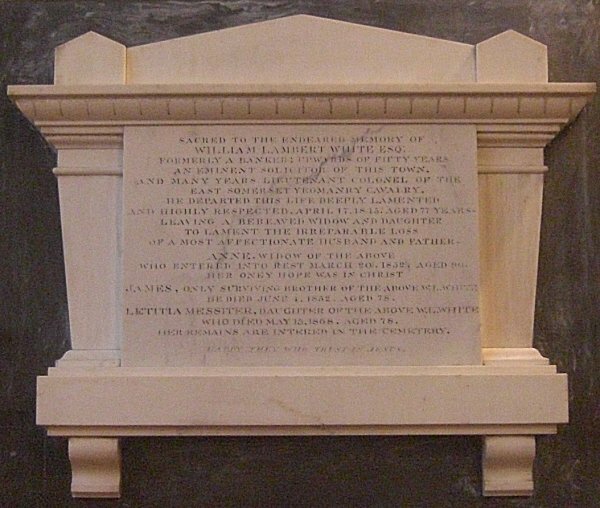 The memorial tablet in St John's church erected to the memory of William Lambert White, his wife Anne and daughter Letitia.